There has been a lot of discussions around the net on the non-customizable and non-removable Windows Vista startup sound. Robert Scoble has a post that explains why the Vista team decided to design it like that. My personal opinion, like Roberts, is that I would like to decide for myself if I wan't a startup sound when I turn my computer on. For example; at home I have Windows XP Media Center which would benefit from having that sound, it lets me calibrate the volume before I put on a movie and it makes me aware of when the machine is up and running. But when I'm on the road, especially on trains, or in areas where people get pissed if someone even whispers like lectures, seminars etc it is so embarrassing turning on a machine and have a high volume Tadaaaaa telling everyone that you just booted your computer. On the Windows Vista Team Blog they justify and compares the sound to the startup sound of Xbox 360. We are talking about a device that you normally don't have with you on the road and when you fire it up you really want some nasty sound! So - Vista guys - make it an option for us to turn the sound on or off. -class called acronym, this can be customized with the properties sidebar of the plugin, so you can easily mark up your acronyms. 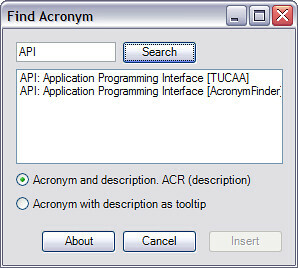 You can download the setup file here:Download Acronyms plugin for Windows Live Writer. If you have any suggestions or comments or find anything unusual don't hesitate to contact me at wictor [a] wictorwilen [dot] se. Tim Heuer has written a really nice Flickr plugin for Windows Live Writer, flickr4writer. Go check it out and/or contribute with expertise or ideas. I'd like to see an Upload to Flickr feature of flickr4writer in the next release. I spend a lot of time using mainly two applications; Microsoft Visual Studio (2003 and 2005) and Microsoft Office (2007). Microsoft Office 2007 introduces a new user interface that simplifies the usage a lot. I am a devoted reader to Jensen Harris Office User Interface blog and it has taught me a lot and given me influences on how user interfaces should be built and I try to take his advices in account. When it comes to how the interface should be designed for usability I think heavily depends on the application but that should only be parameters for the rules of interface design. If you compare Visual Studio and Word - two really different applications but in both you, most of the time, write a lot of text/code. In Visual Studio you use a lot of tool windows and in Office the task panes becomes more and more useful (I really hated them in the beginning). So the basics are pretty common. The adaptive Ribbon works really smooth. I really these three would fit just perfect into the next big upgrade of Visual Studio, and I'm not alone, it will not be in Visual Studio 2007 (Orcas) but I wish and hope for the next version, perhaps 2009? Yes, I know that a lot of programmers use keyboard shortcuts instead of a mouse and would not gain as much of this as others, but to my experience (did a fast check at work) about 50% of the developers use the mouse to build a solution or project. I think Visual Studio, now with all the different designers, and even the possibility to create your own designers, would gain a lot from getting a the Ribbon. Aaron Brethorst, Program Manager at Microsoft, has his thoughts on the Ribbon in Visual Studio, in the post Sprinkle on a Little Ribbon and You're Good to...Oh Wait. I might agree with him that it would not be that easy to get it into Visual Studio. There might be something in between of the myriads of toolbars in todays Visual Studio and the Ribbon. Refactoring should gain a lot from having a Mini Toolbar. Just select the code with mouse and have a Mini Toolbar pop-up with refactoring functions, comment out possibility, create a region and others. Here is an example of bad design in Visual Studio when you use the mouse. Let's say that you are writing code and would like to create a new function. When you have written the code a small box appears under the first character of the function and you have to hover the mouse to that position and then you will get a small box in which you can click. When hovering this box it will expand with a drop down arrow. Then clicking it will give you a number of choices. In this case the possibility to generate the stub I wanted. Would'nt a Mini Toolbar be prefferred here? I gues that Fitt's Law was not used when this interface feature was designed. Jensen Harris: run on over to the building where the Visual Studio interface team members are sitting and give them a few lessons in user interface design. The posts are everywhere that Internet Explorer 7 RC1 is out, and I'm not late to test it out. The download of 15 Mb was fast and the installation was easy; it did uninstall the previous beta of IE7, rebooted and installed the RC1. But then the experience was really nice. I checked out a few known bugs which were corrected. I have used IE7 as my primary feed reader since beta 1 and in my opinion it was far from good from the beginning but now it's fast, much faster, easier to navigate (I'm a space bar scroller, which did'nt work in previous betas) and it renders large collections of posts faster. The rendering also seems more stable and fast, I did a quick check on digg to see the known rendering problem there (the logn/profile part was positioned wrong previously) and it seems gone. Instead we there seems to be trouble with the Google Ads at the top. This is just me testing my own implementation of MetaWeblog API made in C# and ASP.NET 2.0. This post is created using the Windows Live Writer (beta) which of course did not work directly. I had to do some special fixes to get the MetaWeblog API to work according to the specifications I read through. I'll get back about that another day. Now I got to go home to put my daughter to bed. According to Lawrence Liu Microsoft will release a a demo with Microsoft Office Server System 2007 for Virtual Server as a .VMC and a virtual harddisk for Microsoft Certified Partners as a part of the Techinical demonstration toolkit during the next 4-6 weeks. This is great, I guess that it will contain the latest build, and gives us a good opportunity to test and show the new functionlity of MOSS without having to set up new servers or VM's. I'd like to see more of this: ready-to-run virtual machines for betas and especially a ready-to-run and optimized setup for Windows 2003 R2 with and/or without SQL Server 2005. Finally an update to the beta of Windows Desktop Search 3.0. The user interface is back, looking like the 2.6 version, and it works really nice. Looks like the problems with Outlook 2007 and One Note 2007 Beta 2 is gone and it consumes less memory. This update is required for the Microsoft Office 2007 Beta 2 Techincal Refresh release that will be upon us soon. The incredible Jensen Harris gives you all the details on how to use Fitt's Law to improve the user interface of your application in the post Giving You Fitts. The article gives you a good insight on how to create a great interface using a mathematical approach instead of just lettting a art/creative director making the job. It explains why the northwest corner (as Jensen told us it should be named) has changed so dramatically. This is a follow up post to my last about optimizing the Microsoft Virtual Server hard disks. John Howard, program manager of Windows Virtualization, have a post on how to reduce the size of a VHD: VHD Size Reduction that is worth checking out. Microsoft has release Service Pack 1 for Microsoft Visual Studio.NET 2003. The Service Pack contains a number of hotfixes as well as some improvements, read the release notes for more information. I successfully installed the Service Pack, which is not the case for everyone. Scott Dart (Program Manager) has a good blog post on Metadata and the Windows Vista Photo Gallery. An interesting article on how Windows Vista Photo Gallery reads and handles the metadata in photos. Since I am a Media Center freak with a lots of digital photos I really hope that Media Center uses the most of this metadata, as I wrote in previous posts; here and here. Here is a tip and some help for you out there who are using Microsoft Virtual Server 2005 R2 for optimizing the hard disk of the virtual machines. First of all make sure that you hard disks are fixed size, that means that they don't have to expand during runtime. Then take advantage of the Virtual SCSI adapters, when the Virtual Machine Add-Ons are installed on the virtual server you will have a significant performance increase of up to 20 %. Start the server and you are done! I found this post about Windows Live Writer at MSTechToday. Windows Live Writer is a desktop application that makes it easier to compose compelling blog posts using Windows Live Spaces or your current blog service. Read more about it and download it at the Writer Zone. The installation program also installs Windows Live Toolbar. Google has introduced a new Video Search which can be reached from the menu at the Google web site, read about it in the Google Blog. This is a nice new feature in which you can upload and share your videos but this post is not about that feature it is about that the Video link has replaced the nice Groups search link!! When stumbling upon a problem or whenever I try to find help on something I Google for it, and browse throught the first ten hits - then I just click on the Groups link to make the same search in the news groups, where most of your questions are answered. Now I have to click the more link and then select Groups which gives me one click more. Please Google put the Groups search back as soon as possible! Never set Windows Update to automatic! Yesterday I wrote about our new server which is now up and running nicely hosting a number of Virtual Server, this morning none of them was up and a few sites and applications was down. This was due to that the server had Windows Update set to Automatic which is recommended by the OS - which had led to that the server rebooted. I've seen it before so this time I found the resolution quick, but the last time it caused me a headache! Ok, this may not be new to a lot of you or you have never even thought about it - me neither until a few days ago when I was happily unpacking our brand new Dell PowerEdge 2950. I assemled it fast and inserted the Dell OpenManage Server Assistant CD and followed the instructions to install it, this is usually the fastest method and involves so little interaction, everything went fine and it started configuring the RAID and copying files. But after an hour or so I checked it and it was complete at 42%, and I thought lets eat lunch and give it some more time. When I got back it was still stuck at 42%. I rebooted and took the same procedure - and it stalled at 42 again. The I tried to get old-school and do it manually, reboot and in with the W2K3 CD and I hit F6 to install 3rd party drivers and it asked for the drivers and then it said it could not locate a floppy disk driver, which I ofcourse did not install or order to the server! What is this, it's now 2006, and I am trying to install Windows Server 2003 R2 and it still asks me to use a floppy disk!!! You can't use a USB memory or a CD or anyting else but a floppy disk! After an hour or so searching the internet and running around my colleagues trying to find a floppy disk with an USB interface (which should work according to Microsoft Support) I was back to square one. In a desperate mood I tried the Server Assistand CD again and it still got stuck at 42% even after waiting for a few hours. A side note here is that when it was stuck the mouse worked but the CD-tray could not be ejected. When I was so close to give up and throw the server out of the window, I downloaded an old version of the Server Assistand software and tried it! Tadaaa - an hour later I was up and running! You learn stuff every day and this time I learned that floppy disks is still a vital part of a modern operating system. Let's see how it is in Longhorn Server and does anybody know how it is in Windows Vista? A few days ago I complained about not being able to categorize photos in Vista Media Center using metadata. I was using the 5384 (beta 2) build! But in the most recent builds there are a new pivot called Tags, in which you can watch the photos organized by keywords instead of only by date and folders. The tags can be edited through the Windows Photo Gallery and is persisted in the image. Read more at Matt Goyer's Media Center Blog. Microsoft Windows Vista contains Windows Media Center (in Home Premium and Ultimate) which is a great upate from the Windows XP Media Center Edition. Finally the user interface is taking advantage of widescreen and the navigation is faster and smoother. But I think one big thing is still missing in the Media Center interface - editing, sorting and searching pictures using metadata; today you can sort them on date taken! I would find it more useful to search for all images containg images of my family, my vacation in Spain or winter images from our summer house. Jpeg images can contain EXIF metadata which can be edited through the normal Windows Explorer interface or other programs. Take a look at Adobes Photoshop Elements in which you can drag and drop the images into categories that is stored in the EXIF information. Wouldn't it be great to have that built into Media Center - anyone hearing me up in Redmond?! When viewing an image you press the (i) button on the MCE hand control and select Edit Metadata (or similar) then you can check which categories it should be in or add a new one. Then when viewing the images you could select which category to view. Blake Handler has compiled a nice list of 150 free Microsoft Windows applications called Ultimate List of Free Windows Software from Microsoft.